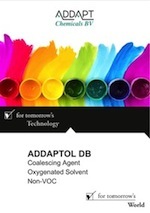 ADDAPTOL DB is a non-VOC oxygenated solvent for use as a coalescing agent in water based coatings. ADDAPTOL DB is also used in floor lacquers, coatings for concrete surfaces and other coatings where high performance is needed. ADDAPTOL DB is a non-VOC oxygenated solvent for use as a coalescing agent in Waterborne systems and tail solvent in Solvent borne systems. BioWet PC is a non-VOC polymeric coalescent for use as a process aid in Waterborne Systems to improve film forming properties.